When we last saw our familiar cast of characters, Gru (Carell) had given up villainy, married Lucy (Wiig) and settled down to raise the bookish Margo, Tom-boyish Edith and adorable Agnes, surrounded, of course, by the Minions. When we meet them, everything is pretty much the same. Gru and Lucy are now agents for the Anti-Villain League and their current assignment is trying to stop a diamond heist being planned by the notorious Balthazar Bratt (Parker), a one-time child-star turned TMZ-style bad guy. When Gru fails at the assignment he is summarily fired by the new boss. 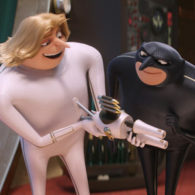 Down on his luck, Gru learns that he has a twin brother, Dru (also Carell) who not only has a beautiful head of blonde hair but has longed to be a villain. 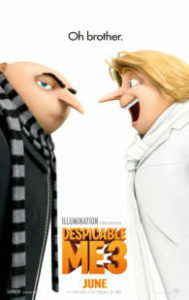 He and Gru team up to steal the diamond from Bratt, with Dru thinking he is part of a villainous operation not knowing that Gru intends to return the diamond to its rightful owner and get his job back. Oh, and the Minions are back as well! One of the most entertaining animated film series ever, “Despicable Me 3” continues the Illumination Entertainment tradition of turning out top-notch films that the whole family can enjoy. The new characters breathe life into the series and it’s always a pleasure to hear the vocal skills of “South Park” co-creator Trey Parker, who even goes a little bit “Cartman” here. The level of comedy for the adults is high while the Minions are plenty to keep the kids entertained. While the popular Kevin, Stuart and Bob are missing, presumably off on whatever adventures will make up “Minions 2,” “Despicable Me 3” introduces us to Mel, soon to be, I’m sure, the next big Minion star, an honor well deserved.